Hand-crafted for that luxury look, these stunning, high quality Diamante dog collars are adorned with 5 rows of sparkling rainbow crystals. Made from crocodile print PU leather with a sparkling crystal buckle for extra style and chic- perfect for your posh pooch! 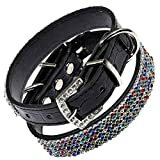 Please Note: These are fashion collars and, as such,are for occasional wear and should not be used as a restraint when walking or training your pet. This item runs small a little.Pls pay attention to the size before payment!!Thanks!!! 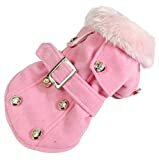 Function: Keep your dog stylish, cute, clean and warm. Dogloveit is a registered trademark. We do want to provide the best products and service to our customers. Sizing for each dog is unique. Similar to our clothing and accessory, medium size from one designer is not the same for another. So please check with the size chart carefully so that you won’t get the wrong size. We provide STANDARD SHIPPING to every order you placed. For now, we do not provide fast shipping because we cannot guarantee the package will arrive in 1-3 business days. For STANDARD SHIPPING, we use USPS International ePacket. Standard Shipping: usually 7-15 business days. But there is no such option for us to choose in Amazon’s System but “17-28 days”. So you will find the Estimated Delivery Date too long. In fact it is not ture. Most of our customers receive their package in 5 – 10 business days. You can check it in our feedback. You satisfaction and feedback is really important to us! Please leave a positive feedback if you are satisfied with our item and services. We wish you had a comfortable shopping experience!